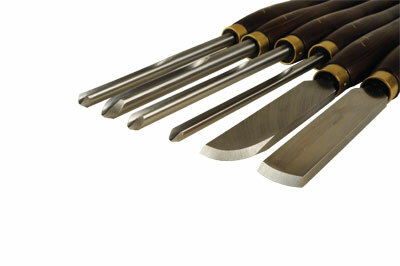 This is a set of signature tools from Glenn Lucas manufactured by Hamlet Craft Tools. The set contains two negative-rake scrapers and four bowl gouges. The tools are all relatively standard Hamlet tools, but they are all ground to Glenn's specification. They all come with 400mm timber handles and have Glenn's signature printed on the handle to distinguish them. In my opinion, what sets these tools apart from other signature tools is that they are supplied with a comprehensive instruction leaflet that describes their use and how to sharpen them. The leaflet gives the bevel angles for all the tools and gives jig settings for the four gouges for four of the more common sharpening jigs, so you are able to reproduce the factory grinds. The leaflet also includes useful diagrams of what the grinds should look like so you can check if you are reproducing the grind exactly. Also shown is the colour coding Glenn uses in his workshop. Glenn suggests putting a strip of insulation tape of the appropriate colour on the shaft of each gouge so you can tell the tools apart more easily and find the appropriate jig settings more quickly when going to sharpen them. The two negative-rake scrapers are labelled GL1 and GL2. The GL1 has a French-curve profile while the GL2 is a round-nose scraper. Both scrapers have a bevel angle of 33° on each side. This is very acute, making them almost like skew chisels, but they have a much increased thickness to reduce vibration. The acute angle allows you to achieve a very sharp edge, but it will require touching up more frequently. The negative-rake makes these tools very easy to work with. 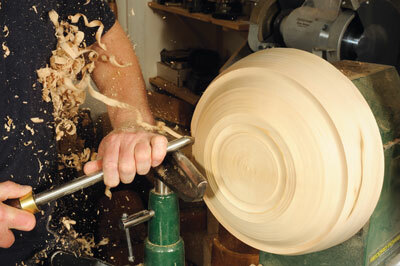 The tools can be held flat on the toolrest or with the handle slightly down, which is much easier and more forgiving. I think the French-curve profile of the GL1 would meet all the curved-scraper needs of most turners. The gouges are labelled GL3 to GL6. They all feature the same parabolic flute profile, much the same as that on the Hamlet Masterflute gouge. This flute shape has a few advantages over the more traditional 'V'- and 'U'-shaped flutes. Firstly, this flute is less likely to clog with shavings, especially when cutting wet timber, because the 'bend' the shavings have to turn through is much gentler and the top of the flute is much more open, so it is easier for the shavings to escape. Secondly, the parabolic flute makes maintaining the smooth curve on the wing of the tools much easier when sharpening. On gouges with 'V'-shaped flutes, it is hard to avoid having a 'dip' in the curve just behind the nose of the gouge, which affects the behaviour of the cutting edge. It is much easier to eliminate this dip with the parabolic flute. All these gouges also feature secondary bevels to reduce the likelihood of creating ridges on the inside of bowls, which can occur from gouges with single bevels. The GL3 is a heavy-duty gouge made from 20mm bar with the same grind as the GL4. This gouge is intended to take heavy cuts when rough-shaping unseasoned timber. In my opinion, the GL4 does the same job as the GL3, albeit a little slower, but overall it is more versatile. It is made from 16mm bar and therefore is a bit more manoeuvrable in use. It can be used for rough shaping and refining the shape of bowls, etc., both wet and dry. Both these gouges have a 55° primary bevel with a fairly long secondary bevel at around 45° - not actually specified on the leaflet. The shape of the cutting edge flows in a smooth curve from the wing to the tip and around to the other side. The GL5 is made from 12mm bar and has a similar grind to GL3 and GL4, but with a primary bevel angle of 45° instead of 55°. Again, this gouge has quite a long secondary bevel. This gouge is intended to be used for refining the shape of a piece and taking finishing cuts. It is used for all the outside finishing cuts and down the inside of a bowl as far as the transition to the bottom of the bowl. The acute angle takes a keen edge and, when used in a push cut, this gouge can leave a finish that requires no scraping and minimal sanding. 8 o'clock on the lower part of the wing, depending on whether you are doing outside or inside cutting. The GL6 gouge is also made from 16mm bar and is probably the most specialised of the gouges in this set. It is used for cutting at the bottom of bowls. It has a much shorter wing and the bevel is at 55° with a very long secondary bevel. This tool works better with the flute vertical, cutting with a point just left of the nose of the tool. All in all, I really enjoyed working with these tools. The gouges cut very efficiently, quickly removing bulk material and getting to the finishing cuts with minimal fuss. The finishing gouges left very good finishes that required little or no scraping, but where scraping was required, I found the GL1 was easy to control and left quite a good finish. These tools are all made from M2 high-speed steel and take and hold their edge the same as other M2 tools. They are quick and easy to sharpen following the enclosed instructions. This is quite a useful set of tools, but in my opinion the GL2 round-nose scraper is rarely required and the GL3 heavy-duty gouge is only required for large-scale faceplate work or by professional turners for whom speed is very important.